What was it like to choreograph the Back to the Future movies? Michael J. Fox in Back to the Future. First of all, not everyone involved with Back to the Future was able to work on the second and third films. Due to the nature of the film industry, where one goes from project to project, some people were unable to work on all three films. I was lucky enough to be able to participate in all three, and all of us received black leather bomber jackets with the logo and additional stripes to indicate if you had worked on all three. I was hired to work on the film in the fall of 1984, and it was my first film as choreographer. I had only assisted other choreographers on films, and I had just completed working as an assistant choreographer on the ill-fated A Chorus Line. I was aware at the time that it was going to be less than stellar, in spite of the director Sir Richard Attenborough, who had won the Best Director Oscar the previous year for Gandhi. Nevertheless, when I returned to Los Angeles, I was called to interview for a new movie to be produced by Steven Spielberg’s production company, Amblin, and directed by Robert Zemeckis. I showed up for the interview at Universal Studios, where Amblin was located, and was interviewed by producer Neil Canton. All I was told was that there was a character in the film who at one point is back in time and plays a guitar solo in which he basically demonstrates elements of all the classic rock ’n’ roll guitar moves from Pete Townsend to Chuck Berry … in front of an audience of teenagers who have not heard rock ’n’ roll, as it has yet to be invented or performed in their time. It sounded like something I could easily feel comfortable with, as I had spent part of the year before touring with Stevie Nicks and watching guitar legend Waddy Wachtel onstage every night. I was excited to get the call shortly afterward that I had been hired. As soon as the script arrived, I sat down and read it in one sitting. I had read scripts of movies I had worked on before, and I knew this one was something exceptional. It was the first script I had ever read that you just knew was a great movie. It didn’t require any changes or additions—it read exactly like the finished movie. It is still, to this day, the only script that I’ve ever read that was already a great movie just needing to be shot. Back to the Future at first glance doesn’t seem to need a choreographer. I was hired to choreograph the Enchantment Under the Sea–themed dance that takes place near the end of the movie. The gym was to be filled with high school students dancing to the pre–rock ’n’ roll music at first, and when Marty McFly takes to the stage for “Johnny B. Goode,” they dance with unbridled joy—that is until Marty takes it a little too far into the rock ’n’ roll future and they are left with their jaws dropped. When I tell people that I choreographed Back to the Future, they sometimes ask about what was choreographed in the film. What people often don’t realize is that when an actor in a film suddenly starts using his or her body to perform to music in a scene, the movement needs to be staged by a choreographer. These kinds of challenges are my favorite. Take an actor—in this case Michael J. Fox—and find a vocabulary in his or her natural movement that I can then design in a sequence to music, thereby making sure that the dance and movement are organic to the actor and character. I have always enjoyed the challenge of working with actors as opposed to dancers. With a professional dancer, you already know that whatever you choreograph, he or she will be able to master the movements both quickly and perfectly. But with actors, the challenge is creating movement drawn from their own movement vocabularies so that the characters they are portraying will be as organic and truthful as possible. What good is asking an actor who is usually untrained in dance to perform movement well out of his or her comfort zone? The whole point is to make it easier and as organic as possible for the actor to be believable dancing and moving as that character. I always have enjoyed the process of getting an actor into the studio and working with him or her to find what physical vocabulary can be used to build a truthful performance. 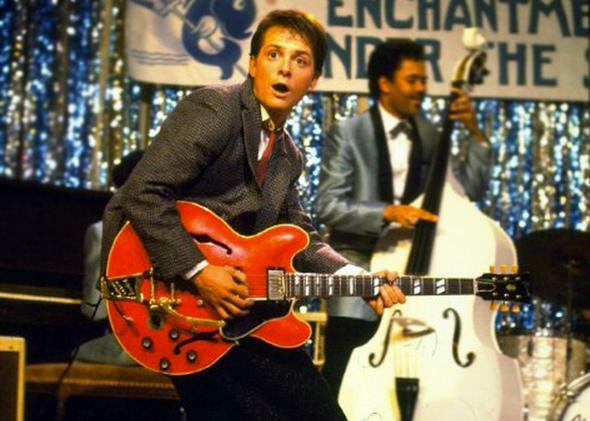 With Back to the Future, the dance and guitar solo that Marty McFly performs turned out to be one of the classic moments of the film. Working with Michael was a joy. He was so enthusiastic and ready to try anything. We were able to get the staging polished in very little time. He was also working on the TV series Family Ties while we were rehearsing and also while filming Back to the Future. He had such wonderful energy and enthusiasm that it was more fun than work to rehearse with him. Now as many Back to the Future fans know, Michael J. Fox was the second Marty McFly. The original actor was cast and had started to be filmed when it was decided that Michael was a better fit for the role—but not before I had the chance to begin rehearsing the original Marty. I had one or two rehearsals with that actor before the role was recast with Michael in Marty’s shoes. The first Marty was a great actor, but Marty was really Michael J. Fox’s character to play. On Back to the Future Part II and Back to the Future Part III, I was asked back by Bob Zemeckis to restage the dance sequence for the second film and to create a square dance for the third film, mainly for Mary Steenburgen and Christopher Lloyd. All three films were a joy to work on. In my experience, the tone of the set and work environment is almost always determined by the director, and on the four films I have been fortunate to create on with Bob Zemeckis, there is a level of respect given to all the creative contributors, whether they are set designers, costumers, or in my case choreographer. I have felt that Bob hires the best creative people to work with, and then does something unusual in Hollywood: He lets them do the jobs they were hired to do. All the departments treat one another with so much respect, knowing that if they were there, they were the best. Movies: What is the one movie you watched that changed your life the most? Back to the Future (1985 movie): What predictions about 2015 in Back to the Future have come true? Movies: Why do so many people want Marvel to make a Black Panther and Black Widow movie?